I have created a query that produces multiple result sheets. However, when I try to export the results either by saving as a spreadsheet or by exporting to excel I am only allowed to export/save one result sheet at the time. Has anyone a useable workaround? I guess that I should redesign my query to output raw data to excel and to the real analysis there. The reason for the multiple output sheets is that it isnt possible to filter objects. This is another major issue with the query engine. Are there any plans in adding that kind of bread&butter functionality? In the last version this is a new feature. I'm quite sure that is is version 10.0.6.1. Can you explain what you are trying to filter? I'm on 9.8 so that seems to be another reason to upgrade then. 1. 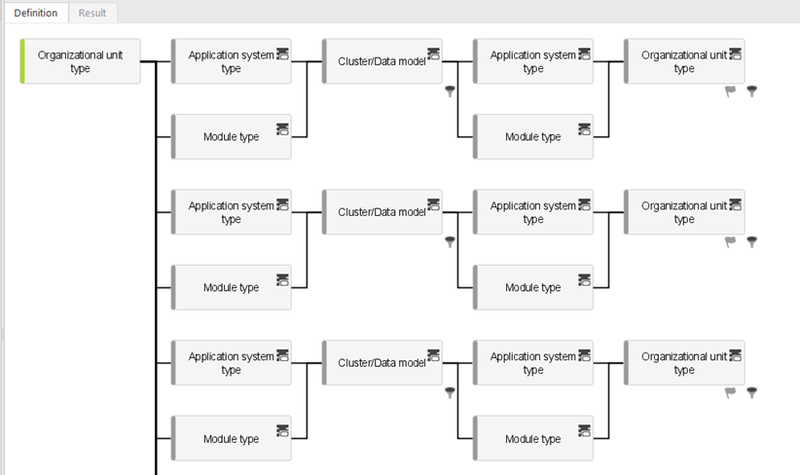 Define a query that finds all Application System's with a relation to an Organizational Unit. 2. Define a result spreadsheet that lists the result, Application systems and their related Organizational Units. 3. Filter out rows containing "HR". I can define the query so that "HR" is omitted by adding a filter to the query object. But that is hard coding the query for a specific filter requirement and forces me to design a much more complicated query. If i have 10 different Organization units it is doable but whatabout hundreds? I would accept that filtering has to be done in a spreadsheet model but that too seems to be impossible. Only solution is to export a long list of applications and organization units to excel and perform my analysis there. We are not sure that we exactly understand your problem, but the most reasonable solution seems to be the already mentioned filtering in the query definition. The filter is added only once, no matter how many organizational units will be shown in the query result. With this approach, you can even create multiple result spreadsheets where each one will have different Organization unit - one sheet with HR, one with Sales, etc. Or you can combine them all to one spreadsheet, it is up to you. If your query has more nodes after the organizational unit, you can also use the Join functionality to make the query definition simpler. After you use the filtering and re-run the query you will see in the spreadsheet only the filtered organizational units. Your solution is similar to the one I found. I created the logic in the branches as a separate query and inserted it for each branch and added unique filters for each result. This is doable when the expected result is known. If it is not known in advance or the exact filter combination desired by the end user is hard to predict, it would be better to filter in result or in a saved spreadsheet. Please see attached image result.png. 2. Make large results easier to consume. - Another (made up) use case would be a query show where in the process landscape applications are being used. Both sub-processes and applications exist in hundreds in our DB. Each process owner is only interested by a selection of the result but exactly which is both hard to predict and even if possible, difficult to maintain. I want to give them a spreadsheet and the possibility to filter out their unique selection. I do understand that I can create separate spreadsheets but that still requires me to know their preferences in advance. I wouldn't know if the want to study the sub-processes they have been assigned to or perhaps understand what other sub-process use the same application as the sub-processes they own? Right now I would export the complete list to an excel file and let them filter according to their needs. My ambition is to define queries as generic as possible so that ARIS designer user can do as much as possible with the result without me (the administrator) having to customize each query for each user. Yes, the options are quite limited in your described case that the users (process owners) don't have the right to modify or create queries. Besides the mentioned solutions one more thing could help - sorting the spreadsheet. While the data is sorted by a certain column (or even by some object attribute) the required data is easier to find. You have two options how to do it. Save the general query spreadsheet as a table and the users will open the spreadsheet separately (without the query). The downside is if the data structure changes, you need to re-run the query and export the spreadsheet again to have fresh results. Use sort/multisort feature that is available since ARIS 10.0 SR4. With this feature you can sort the query spreadsheet directly in queries. In this particular example each person that is in some organizational chart can easily find himself as the column with names of people is alphabetically sorted. In your example I would suggest to sort the column E in a general query, therefore people could easily find the corresponding Organization unit type(s) that they are interested in. I am obviously a few years behind as I'm using 9.8.